The ‘Lalaing’ copy, in French. Manuscript written 1482, illuminated before 1519. 336 x 230 mm. – 193 leaves. With 3 large miniatures. The author of this text, Martin le Franc (1410-c. 1461) was canon and provost of the Chapter of Lausanne Cathedral. He wrote L'Estrif de Fortune et de Vertu at the request of Philip the Good, Duke of Burgundy (1393-1467). The text relates a verbal joust between Lady Fortune and Lady Virtue arguing over 'the government of this world', while their referee is Lady Reason. While the present codex was written in 1482, the painted initials and the three opulent miniatures were added much later. Their style with elegantly moving figures refers to the circle of the Master of Antoine Rolin, illuminators active in Hainaut and indebted to Simon Marmion (d. 1489), who had been working in Valenciennes for many years. However, the artist of the present book added warmer pigments to his palette. 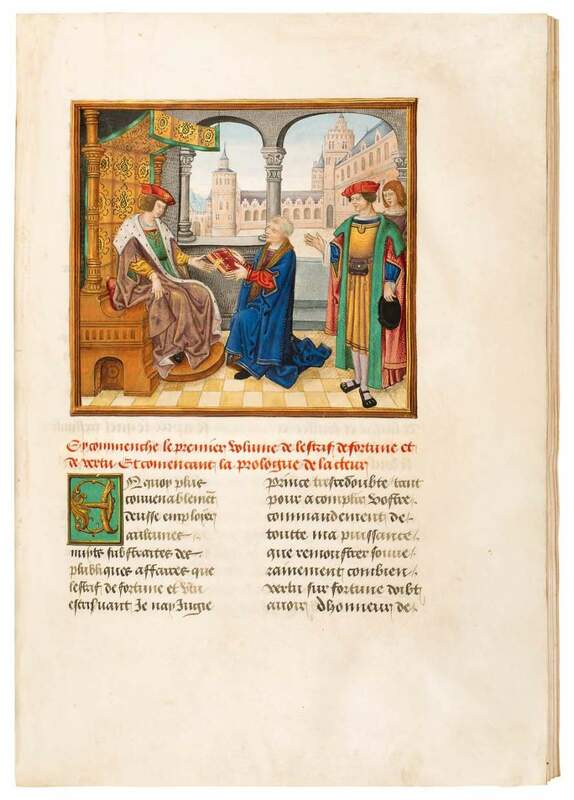 M. de Lalaing who bought the manuscript in 1519, was probably Charles I, seigneur de Lalaing (1466-1525), counselor-chamberlain in the service of Maximilian I, Philip the Handsome and Charles V. Most likely Charles de Lalaing commissioned the illumination as he purchased the book. It was passed on in the family by descent and has never seen the market since the acquisition in 1519.